Item is a wooden and glass framed sign used to advertise the Temperance House which was a non-alcoholic boarding house located at 44 Main St. in Sackville, N.B. Item is a blue and white square program with advertisements on the top and bottom of each page. End page details components of harness horse equipment. 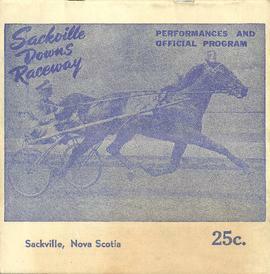 "Sackville Downs Raceway Performances and Official Program"